Thank you for deciding to learn more about our translator training program. If you would like to review the study guide for this training program please click here. To speak with someone on our team please call us at (503) 336-4826 and leave a voicemail if we are on the other line with another translator. To register for the Certified Translation Professional (CTP) Program, please complete the form below. By registering now, you can complete our online certification program and examination process to become a Certified Translator Professional. The translator training video modules and expert audio interviews included within this training are worth over $900 by themselves even though our total program tuition for the complete CTP program is just $397. To show you the high quality nature of our audio and video resources we have made a few available for your reviewing for free. You can download our sample video in Mp4 format here, and our sample expert audio interview in Mp3 format here. Risk Free: The CTP Program includes a 7-week, no questions asked, money back guarantee. That means if you register today for this program, try it out and decide it is not for you, we can refund all of your money back to you immediately. We will refund 100% of your money for any reason within the first month. This way you get to try out our program, explore the benefits and resources, and see if it is right for you. After completing this form, you will then be taken to our credit card processing form, where tuition of $397 is due. After registering, you will be sent a confirmation email, login details for the online training platform on TranslatorTraining.com, and a welcome package in the mail. Need a Payment Plan? If you would like to pay $97 upfront + 7 monthly payments of $57.50 a month, please click here. Trouble Registering? If you can’t or don’t like to use your credit card online, you are welcome to use our Mail-In-Registration or Fax Credit Card Form. The reason I am enrolling in the Global Translation Institute Program is because I have looked for a Certified Translation Professional Certification for many years, but was unable to acquire it, until I randomly caught the advertisement on the Christian walk site. I rejoiced at the opportunity of fulfilling my dream to become a Certified Translator. I believe that Global Translation Institute is filling up a much needed service in providing for Certifications worldwide to make many free lance Language writers and translators such as myself, in professionals that can provide in turn services that many people can benefit from. Thank you for helping me in so many ways to accomplish my long-awaited dream. I am thrilled to continue the journey of studying and learning much more about the wonderful world of communicating and translating English to Spanish or Spanish to English. The CTP certification program with the Global Translation Institute has been an excellent experience for me. I learned a great deal about what it means to be a translator and about how to run a translating business. I would recommend this program to anyone who is considering speeding up their career within the translating field, since it teaches one how to operate effectively as a translator and as a businessperson. Additionally, the support offered by the staff is excellent, and all members have been very welcoming. In my opinion, this is the best value in training for running a translation business available in the USA. This is a great way to obtain certification. Your communication is timely and very well organized, books are easy to read and have lots of useful information, and the instructions for the test are very clear. Even though I have experience in working as a translator/interpreter, I am happy that I made a decision to sign up for the test. The learning experience was awesome and I feel that I am more professionally prepared to face any difficulties that I may encounter as a freelance translator/interpreter. The exam was thorough and intelligent. The amount of time allocated was perfect. Plus, you are better than ATA 100%, since ATA doesn’t prepare you for the exam, doesn’t recommend books, just charges you $300 and gives you absolutely no opportunity to appeal. Thank you for the challenge and the chance. I think the program is very thorough. All the suggested reading was a great compilation of important information. In this program, you can learn a lot of great essential information in a short period of time. This is the right program for someone who is looking to make a career of translation. The CTP Program is just what I was looking for. I have struggled to gain training in the industry and this program combined ith my experience will really help. The overall program is very good. I think that the books that you assigned have a good balance between the practical and the theoretical aspects of the translation world. My favourite was Sofer’s book. It was very specific, easy to read, well structured and it had concepts that were easy to apply in the real world. The exam was also very good in terms of the content. I think it covered the most important aspects of the books and it was challenging even for someone like me who already attended 3 years of translation and interpretation school back in Mexico. I have enjoyed this process. Sure it was lots of readings, but it was worth it. The processes before and during the test ran really smooth. The help and guidance from Adriana was awesome and left nothing to doubt. The time to work on the test was very well calculated. I feel really satisfied with all the process. I would like to complete the CTP Program once I have completed my current projects, I will keep in touch through your CTP email alerts. Thank you for the information. I am quite happy to have had the opportunity to present this test and be a Certified Translator. I do hope that this certification will improve the number of contract jobs for me. I am also very grateful for all the assistance and enthusiasm provided by the team running this program. Perfect to have a better understanding of what translation is all about. Reading the books was an eye opening experience to what a professional translator really is and it gave me so many tools to become a more successful translator. It was very convenient to be able to take the test when I was ready. I am now more motivated to take the next steps. This program is great because it allows you to study and take the test from anywhere. It is very flexible and one can fit this in a busy schedule. The CTP program is great for people, like me, that have a full time job, plus a second job as a translator, and do not have the time to go to classes, do homework, etc. I had been looking for a way to get certified and I was very excited when I found the CTP program that was offered on line. Thanks for that wonderful idea! And thank you, Adriana for your support. You can rest assured that I will recommend this program to other future translators. The CTP Program has been one of the best educational experience of my life. I’d recommend the CTP Program for anyone interested in doing well in translation who is looking for an affordable and professional course that can be taken anytime, anywhere. I firmly believe your program is a very good option for certification, and I am recommending it to some colleagues I know. Your program is comprehensive, timely in all senses and is also quite affordable, satisfying a true need for many translators who require certification but who have very few practical alternatives on a global scale. Being part of Global Translation Institute has proven a wonderful opportunity. Whilst I prepared myself for the examination and reading the wonderful books that were given to study for this exam, it gave me a lot of information and a better perspective of what I need to know and how I need to manage myself as a freelance translator. I highly recommend anyone who wishes to continue this path to be a part of the Institute. Thank you! It was very convenient to be able to do everything online. I found the set books to be very helpful to my major occupation as a language trainer as well as from the aspect of learning about translation work. The ideas of “practice makes perfect” and “translators love learning” I consider to be true and worth mentioning. The CTP is such a great program that allows busy mothers like me to achieve their goals and grow professionally. I loved the way I could study at my own pace and time, and the fact that I didn’t have to set foot on a classroom. I highly recommend it! The CTP program provided me with the opportunity to find out what I have been doing right and what “bad habits” I need to correct. I have been keeping much of the statements from all three readings on my mind and I find myself relating them to my daily routine. With the purpose to get an English-Chinese translation certificate as soon as possible and as cheap as possible to satisfy the need of my translation work, I happened to know the CTP Designation Program, but I was much impressed by the never-delayed answers and the professional guidance to be a professional translator. I found the CTP extremely useful and it definitely gave me the opportunity to get started into the translation business. The CTP course helped me feel more confident in my translation skills and it definitely helped to build my resume. The course load was doable within the suggested time frame and it provided both general orientation to the translation profession as well as helpful tips and knowledge from seasoned translators. I work in an environment where many of my colleagues are full time or part time translators, and I suggested this course to them. It’s a good investment for anyone getting started in the field of translation, as well as more knowledgeable translators. The CTP certification program has been a wonderful opportunity for me to obtain certification without having to leave my far-away island in the Indian Ocean. It’s great on your part to have provided for certification from anywhere in the world! As for the program itself, it is excellent. Of course, it involves lots of reading but, at the end, one has a better understanding of what a professional is. At the same time, I have gathered quite a lot of essential information about the industry. I would definitely recommend it to anyone desirous of boosting his or her career in the translation field. 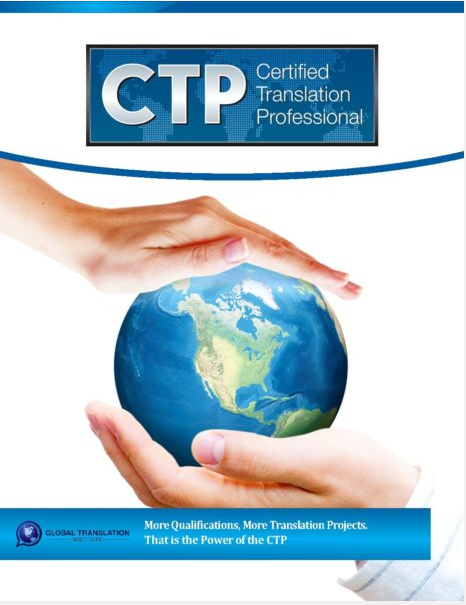 The CTP Designation Program helped me become a better translator. The contents of the materials are very useful and interesting. The program design is very convenient especially in the era of technology which helps you manage time and work from home. The CTP has been one of the most enlightening experience I have had so far in terms of field study. The materials are very well chosen and the whole structure of the program is absolutely fantastic. The website is extremely helpful, containing lots of hints and teaching which helped me to understand so much better what translation is all about. I have valued tremendously the testimonials and the video presentations on the topics. Although we all need to improve and never be satisfied with the level we are at (isn’t this just what we’ve discovered in the course?!) this CTP is very much perfect to me. I am so grateful for having the opportunity to participate in this program. It is so wonderful to have a professional program like CTP; I have been doing translation for the past 4 years without so much understanding of the nobility of this field. CTP program helped me to discover and to be confident that I am a translator to the core and it is worth being one if only I abide within the ethics of the profession. I will, God helping me! Thank you Adriana, for always been there whenever I call. Thank You So much CTP for teaching me the fundamentals of translating and teaching me the different tactics use. Don’t forget to practice timed translations! This was a great personal experience as well. It has mentally stretched me and greatly prepared me! Thanks. The course is a good chance for new translators to have a good knowledge about the different theories and experiences in translation and for experienced translators to refresh their knowledge and to be updated in the field of translation. It is very interesting to read the three books and to prepare for the exam. I enjoyed the reading as well as the exam and benefited from the refreshment and update I gained. 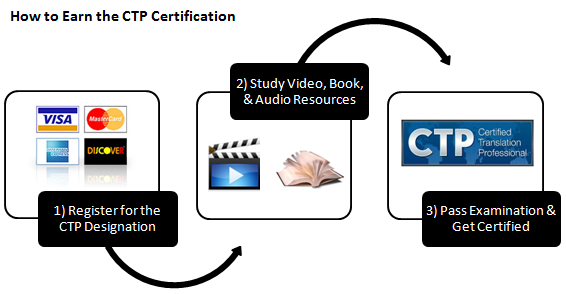 The CTP certification program is a wonderful way to boost your translation expertise. It provides an excellent base of background knowledge to enhance your skills in this area. And it is completely online, which is convenient people who live outside of their home country. I highly recommend it. Overall, this has been a great experience easy to follow instructions, very good online support and very easy to take exam. I am ready to start my career as a freelance translator! Thank you CTP. I strongly believe that this certification program is very interesting. I have learned a lot. The readings are extremely interesting. I liked reading the 3 required books. I learned a lot about the translation industry, they are a great source of information and provide a good ground for future reflection. The CTP Program has provided an excellent opportunity for growth and awareness of the most relevant and important aspects to consider by anyone who is willing to became a professional translator. Particularly, this program greatly helps to organize the wealth of experience obtained in the past and to develop business strategies. The guidance provided is also useful to organize the wealth of experience in the life of translators. In my case, it helped me to review some theoretical concepts I learned during my graduate studies, adapting them to the professional translation work environment. I enjoyed the challenge this exam gave me. The study books were a lot of work but worth it all. Thanks. I think the program is well organized, the answers come straight from the sources(3 books). The constructive feedback would be maybe a little more time, or reference to the books the questions come from. The CTP certification program with the Global Translation Institute has been an excellent experience for me. It is a great opportunity provided by CTP with a lot of useful information and resources. This program is a great opportunity. It is a joy to become a Certified Translator and I believe that Global Translation Institute provides the much needed service in providing for Certifications worldwide to make many free lance Language writers and translators such as myself professionals. This program has helped significantly to acquire a lot of knowledge in the field of translation. This was an interesting journey, with interesting study guides and very useful tips. The test is very well designed and a pretty accurate reflection of the daily requirements for a translator. The 3 text books recommended were very informative and enjoyable to read. CTP program has enhanced my flair for translation, because now I have an in-built confidence that not only, translation is a good business, but it is a worthy service to generations. I am very much aware of the ETHICS of the job now and I promise to abide with it as much as possible! Thank you Adriana, your team and you are doing great job! I enjoyed the translation professional program very much. I learned a lot through studying the recommended material. to further my success as an independent contractor/translator. Thank you translation institute. I really enjoyed this course, I have been teaching foreign languages since 1986. I speak English, Spanish, Portuguese and Italian. I have studied each language for 4 years and I earned a diploma for each. I am also a Montessori teacher and I have a diploma in early childhood education. The exam was really great, I think that you should put an example test online so students can see how a test look like before taking it. I would put the last one or one from another year, but the whole test in the way you will administered, because I thought you were going to put the translation passages first, not the essay questions, the passages take a little more time than the rest of the exam, it would be a great idea to put them first, then the essay questions and the multiply choice questions last. Thank you so much for accepting me as a student and for the help during my course. I really liked the course and I will recommend it highly. I may take another exam for Portuguese and Italian. I enjoyed the program. I found all three books very useful. Not only they provide a lot of theoretical advises, they also have lists and e-mail addresses of translation organizations in different countries. I do have a few comments about the exam. I felt like I didn’t have enough time for the translation part. It was my mistake to spend more time on essays and multiple choice questions and I had to rush through the final part. I’m very glad that I passed but I feel like I could have done a much better job if I had a little bit more time. I suggest maybe having it in the beginning of the exam because it is the most difficult part and it might be easier for people to get it done first.